Whatever design you choose, it is sure to rejuvenate your senses. Even small outdoor spaces can be manipulated creatively to make an outdoor shower an experience worth the hype. 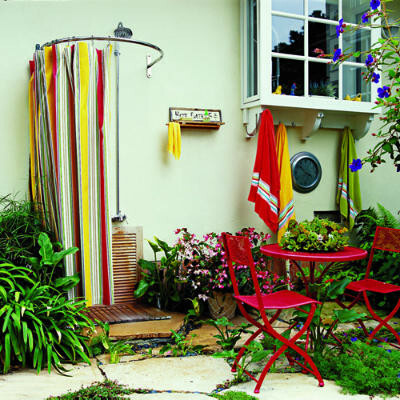 A simple outdoor shower design is a curtain and a shower head in an empty space. 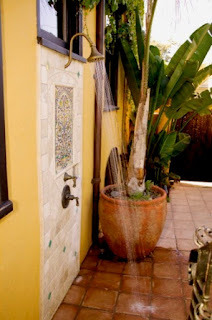 Although this experience in itself is very enjoyable, there are many other ways to spice up and design an outdoor shower that is classic and elegant. 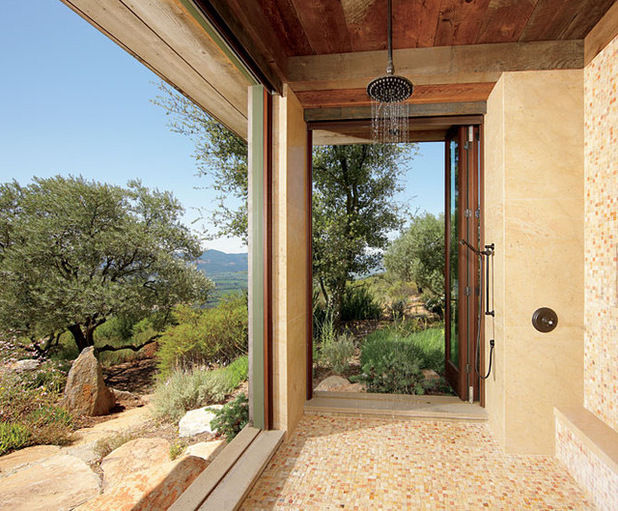 Here, we present to you some of the best outdoor shower designs that exist. You can get inspiration from the same, and tweak it to suit your needs. This is the simplest design featured here. Have some extra space in the backyard? Grab your towels! For you are in for a whole lot of fun! Simple convert the open space in your backyard into a simple yet classic shower design. 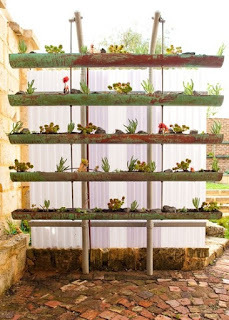 Install a shower head and surround the area by a few plants to surround yourself with greenery, and voila! You have your own outdoor shower! This design will work even for those who have small empty space, as it only requires a shower head to be installed. You can tweak the design by adding some hangers and holders to keep your toiletries handy. For all of you who love woodwork, this will be a dream design for you! 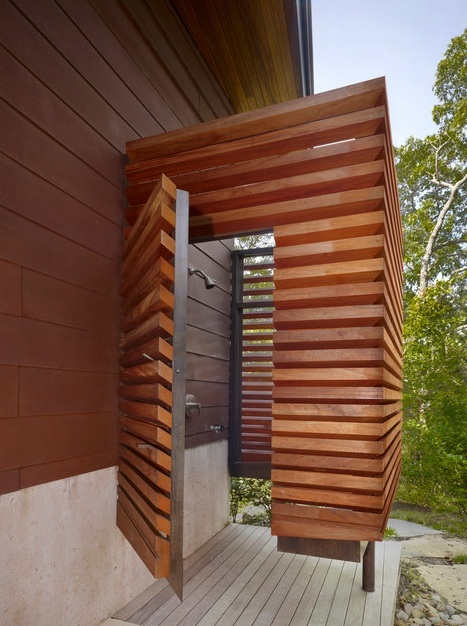 This Modern Patio Shower design is elegant in its own simplicity. The neat woodwork adds to the aura a flavor of rustic feel. The beveled wooden seat is pretty useful to keep your necessities on, and a dedicated shower platform ensures easy drainage and maintenance. 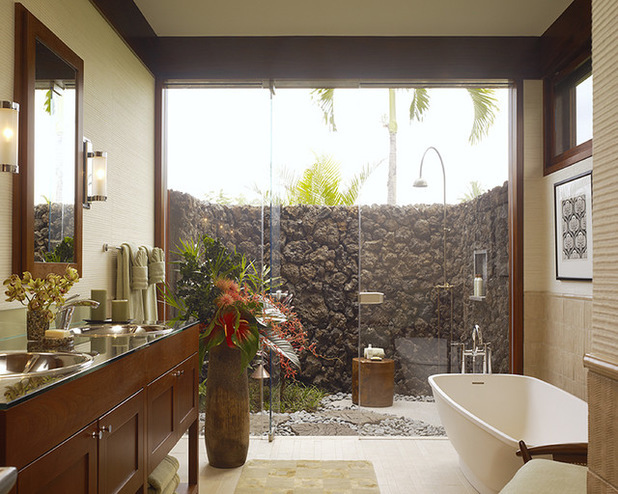 You can add shower curtains, if you desire some privacy, or let the design be and enjoy the open air bathing experience! This one is a Tropical Shower design, with the shower set in stones. The medieval feel exhibited by the entire set up is sure to leave you stranded in awe. A wooden level, not unlike a cut tree trunk, is set up to keep your stuff close at hand. The icing on the cake here is a small lantern set up, which in evening will light up the entire area in golden hues. What an exhilarating experience it must be to wash off all your day’s weariness in this enclosure! This is another old school style shower enclosure. If you have a backyard with stone setting and a semi-open roof, this design will hit right in! A shallow landing made in the base for the shower area will make for easy cleaning and maintenance. The best part you say? Well. The circular skylights of different sizes ensure you have ample of natural light to stay guided. And the lush greenery around is sure to die for! 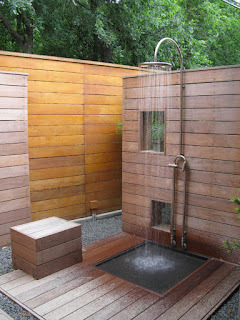 Made of teak wood, this is a simple and elegant design with horizontal spaced bars making an enclosure for shower area. Even the door itself is made to set in with the enclosure design. The shower blends neatly in the surroundings, with lush greenery and open air all around. The spacing between bars is enough to ensure you get plenty of light and air from the surroundings. Even if you choose to tweak this design for solid wood, for some privacy, the open air top will still send in enough sunlight and air for you! If you do not have much open space around your backyard, fret not. We have got you covered. This one is a simple DIY outdoor shower. You can simply extend your indoor bathroom outdoors! Sounds easy, eh? And comfy too! To add a classic touch, it is separated by glass doors, that form an entrance from the indoor bathroom to the outdoor shower. Require privacy? The outdoor rock wall provides you that, apart from beautiful scenery and much more! Here is another insanely creative design for you. This will not require much investment, as it is a two-in-one kind of shower. In this enclosure, disappearing doors are used. 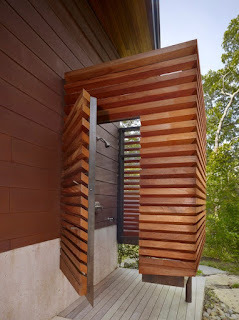 When you need an indoor bathroom, simply shut these doors, and if you require nature’s touch, slide ‘em open! As easy as that! The open air space thus formed is breathtakingly splendid! And you have a multipurpose shower for yourselves. 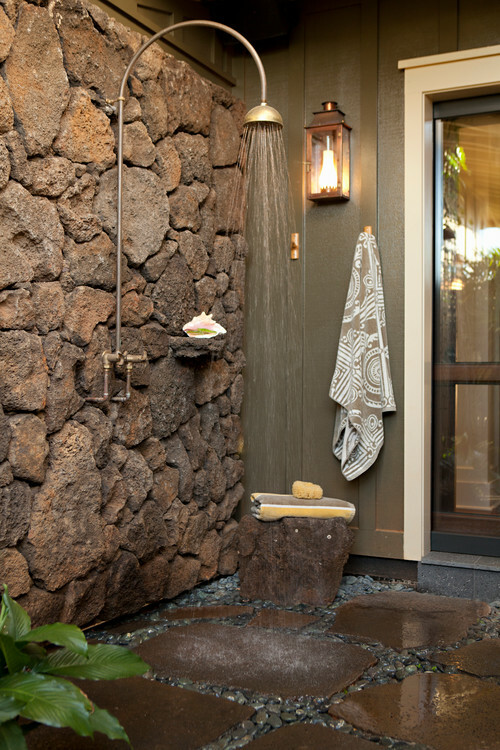 If colors are your deal, this Tropical Patio shower design is for you. It features a semi-circular shower enclosing, that can be kept open to let the air in, or the rainbow colors of a curtain can shut it close and give you some privacy. What’s more, you ask? Lush greenery surrounding you and bright red color chairs and table set in. take a refreshing shower, and have nice brunch with your loved one! This is an experience that is sure to leave you craving for more! The feel of nice, succulent grass beneath the feet after a relaxing bath will only enhance the freshness you attain. 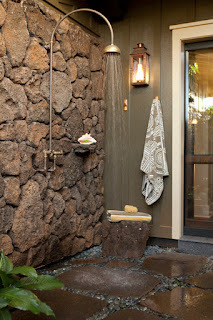 This is a very pretty to look at shower design, and does not seem like a shower in the first look. The stone walls easily blend in with the architecture of the shower, and create vertical walls of a mini garden all around. 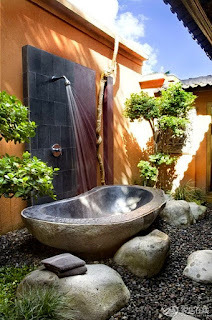 This is a simple Australian garden design that incorporates shower into it effortlessly. Succulent green plants emerge from brown colored back drop and gives off a fresh eminence. So shed those robes and step into a refreshing shower experience. Can’t decide between a bath tub and a shower? Why not get both? 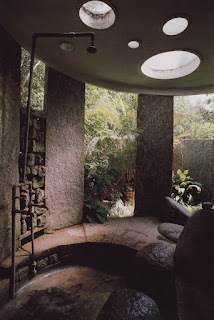 This is a stony design that uses a very simple architectural technique to create a rejuvenation area that soothes the mind and body alike. A stone curved bath tub for relaxation doubles up into a shower platform under the open blue sky with plenty of fresh air. The small trees around give enough freshness to this already open air area. The stones randomly scattered around can work as holders of various accessories you may need to enhance your bathing experience. The stony path and scattered gravel only adds to the scenery of this spectacle. As you can see, the list goes on and on. For all we need after a hard day’s work is some alone time and a cool, nice shower to wash away the day’s dirt and weariness. The choices are endless, and so is the extent of fun you can have! Hope you loved this list of amazing outdoor shower designs!